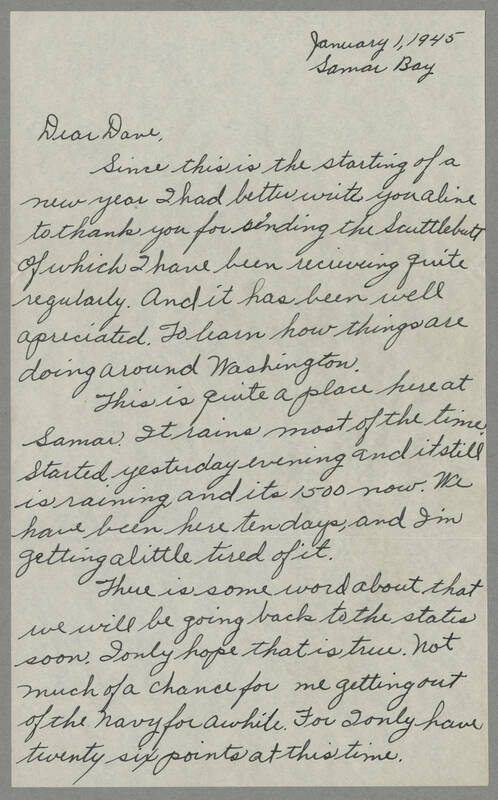 January 1, 1945 Samar Bay Dear Dave, Since this is the starting of a new year I had better write you a line to thank you for sending the Scuttlebutt of which I have been receiving quite regularly. And it has been well appreciated. To learn how thinks are doing around Washington. This is quite a place here at Samar. It rains most of the time. Started yesterday evening and it still is raining and its 1500 now. We have been here ten days and I'm getting a little tired of it. There is some word about that we will be going back to the states soon. I only hope that is true. Not much of a chance for me getting out of the Navy for awhile. For I only have twenty six points at this time.